Three towns in North Wales will be permanently monitored across the border in England after a successful trial. 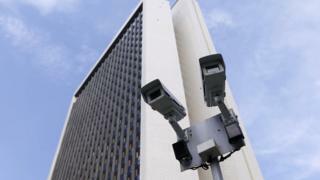 CCTV cameras in Rhyl, Prestatyn and Rhuddlan were watched by Chester council's control room to save money. Denbighshire councils and North Wales Police handed over control, but officers can ask for assistance when tracking incidents. Denbighshire County Council said the "cost effective way of working... improved and enhanced services". Councillor Mark Young, cabinet member for Denbighshire, said: "The council works closely with its partners on community safety issues and wants to make sure that residents in these three communities feel safe in the knowledge that a lot of work is going on to reduce crime and the fear of crime. "This approach with Cheshire West and Chester Council will provide a cost effective way of working which will result in an improved and enhanced service for the communities of Rhyl, Prestatyn and Rhuddlan." District Insp Arwyn Jones, of North Wales Police, said: "For some time, residents and business owners have highlighted their desire to see an improved CCTV function within their respective communities. "I see this as an innovative way of ensuring that for now, and for the future."